The main ingredients? A pair of swirling ropes, two turners to maneuver them and at least one jumper to feel out the rhythm, slip seamlessly in between the ropes and bounce in perfect time. 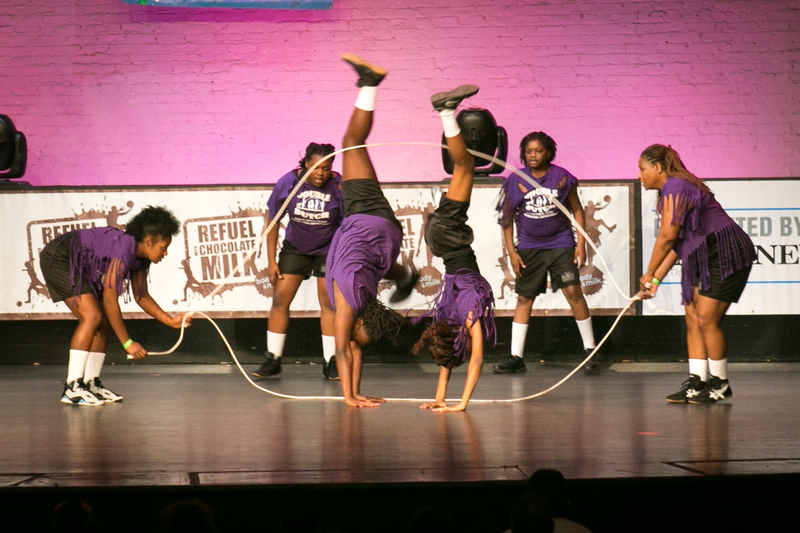 Double Dutch may sound like child’s play, but it’s more than just skipping rope. This game that came to life in the streets of New York City — practiced mainly by girls — is an integral piece of African-American culture. Double Dutch has been a competitive sport since the 1970s, its popularity in cities intertwined with the birth of hip-hop. While just about anyone can do it, the best practitioners use athleticism, finesse and musicality to transform it from a game into a choreographic feat. Yes, double Dutch is very much an art form. And who knew? It even has roots at Lincoln Center. Jill Sternheimer, the director of public programming at Lincoln Center, had no idea herself until she stumbled upon a video circulating on Facebook. The footage, from Skip Blumberg’s 1981 documentary “Pick Up Your Feet: The Double Dutch Show,” chronicled a competition held on the plaza. Zev Troxler shows off his fancy footwork at a Double Dutch Empire pop-up event held in Union Square on Monday night. For ’Til the Street Lights Come On: Celebrating Double Dutch in New York City, which is part of Lincoln Center Out of Doors on Saturday and Sunday, Ms. Sternheimer reached out to Kaisha S. Johnson, a founder of Women of Color in the Arts, who has produced events at Lincoln Center for the past 11 years. What moved Ms. Johnson about the video went beyond jumping. Along with the return of the tournament, which was held on the plaza from 1974 to 1984, ’Til the Street Lights Come On will have jumping stations for all levels, demonstrations, panel discussions and a screening of Mr. Blumberg’s film to place the artistry and impact of double Dutch in a greater context. Ms. Walker took over the league from her father, David A. Walker, a New York City police detective who, along with his partner, Ulysses Williams, saw double Dutch’s potential and helped it become a competitive sport. In 2009, it became a varsity sport in New York City public schools. There are three components of the Summer Classic competition: speed, a two-minute drill in which every left step is counted; compulsory, or specific steps that a jumper must execute, like two turns to the left followed by two turns to the right; and freestyle, a showcase of artistry and acrobatic ingenuity. Ms. Finlayson will participate in a discussion, along with members of three teams, after a screening of “Pick Up Your Feet.” While the Fantastic Four had to stop competing after being featured in a memorable McDonald’s commercial in the 1980s (it changed their amateur status), the group toured, performing with Fab Five Freddy, Afrika Bambaataa, the Rock Steady Crew and others. Their desire, as kids, she said, was to go outside and play. “We wanted to jump, we wanted to be creative,” she said.